Condoleezza Rice (born November 14, 1954 in Birmingham, Alabama) is an American Republican politician, She was the 66th United States Secretary of State. She was the second Secretary of State under former President George W. Bush. She took over from Colin Powell on January 26, 2005, after he stepped down. Rice was the first African American woman, second African American (after Powell), and second woman (after Madeleine Albright) to serve as Secretary of State. Her educator was Josef Korbel, he inspired her. 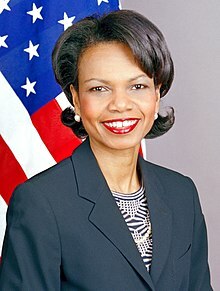 Before she became Secretary of State, Condoleezza Rice was Bush's National Security Advisor during his first term (2001–2005). Before she did this, she was a Professor of political science at Stanford University from 1993 to 1999, where she also was the Provost. Rice was in the 2011 documentary Miss Representation. Rice was a Democrat until 1982. She then changed to Republican because she did not agree with the foreign policy of Democratic President Jimmy Carter and because her father was Republican. Wikimedia Commons has media related to Condoleezza Rice. This page was last changed on 3 May 2018, at 17:33.